Time to kick back with some food, wine, friends and family. Whether you’re hosting your family gathering this year, having a rowdy one with friends or simply taking the opportunity to oscillate between the beach and the couch! 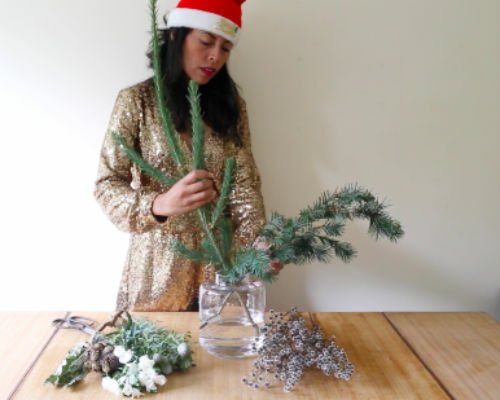 We love the extra time at home, dancing around the house to Christmas carols (Mariah Carey thanks very much) and creating beautiful environments to catch up with our favourite people in. Most of this week’s blooms are pretty hardy, so if you’re feeling adventurous, we encourage you to think outside the vase! These beauties will look amazing laying on a table as a centrepiece for Christmas lunch (check out this week’s vid)! They can also be tied into a beautiful, long lasting bouquet – a perfect chrissie gift for another flower lover! We hope you have a fab holiday season and we’ll see you in Jan! 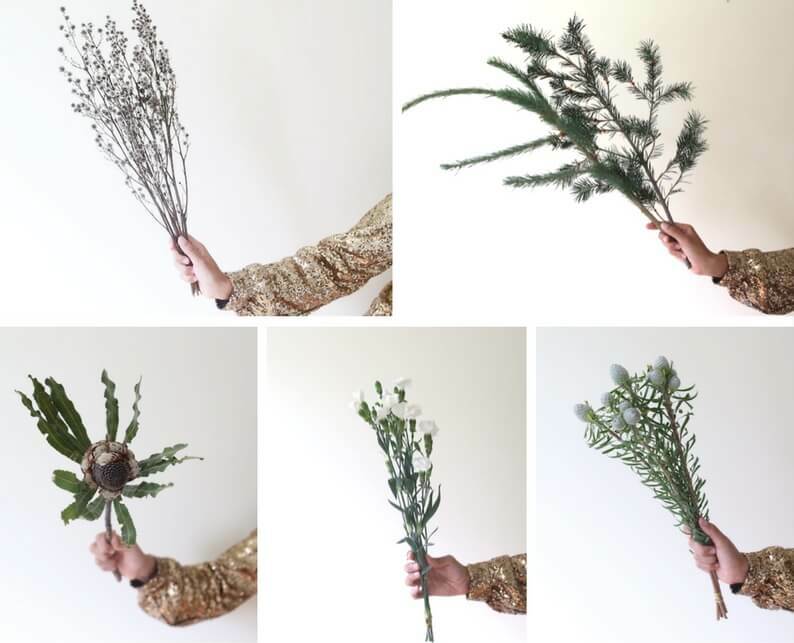 Christmas Bush – This NSW favourite flowers in December each year (convenient!) 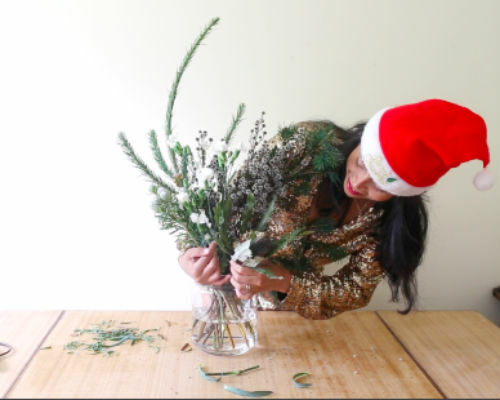 and it’s a favourite for adorning Christmas tables and tucking into festive wreaths for lots of colour and volume. Blackberry or Poppy Pods– A couple of cheeky stems of blackberry to amp up the Christmas feels! Weave them into your arrangement, or use them to adorn your gifts! 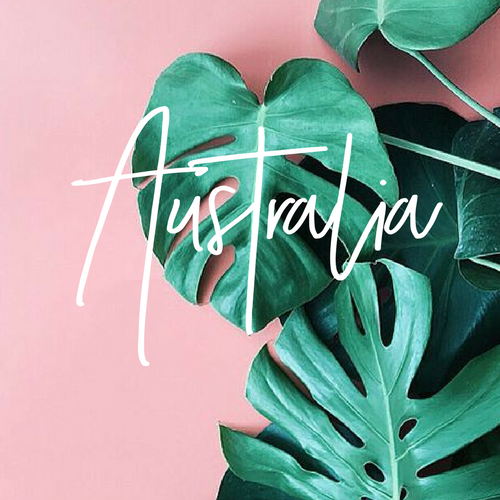 Eucalyptus – A classic and oh so stylish foliage! It’s right on trend styled all on it’s own in a glass vase, but also provides a soft silvery backdrop in an arrangement. Cross stems of your spruce in your vase. This provides the general shape of your arrangement. 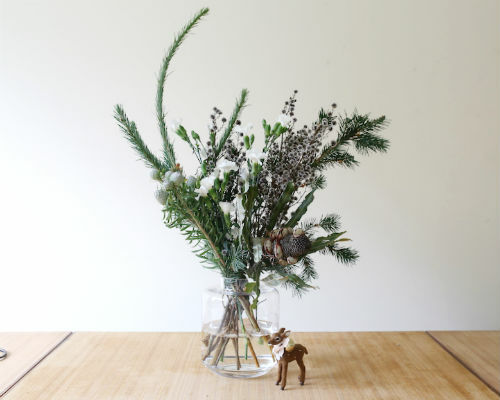 Slide in contrasting stems of natives to add an interesting twist to the vibrant colour of your Christmas greenery. Tuck in stems of smaller flowers like solomio, leucadendrons, spray carnations or alstroemeria, to add volume and lots of texture. Finish off by placing a gorgeous focal flower right near the front of your vase! Keep the stem short and nestle it in, so that it’s sitting just a bit above the rim of your vase. 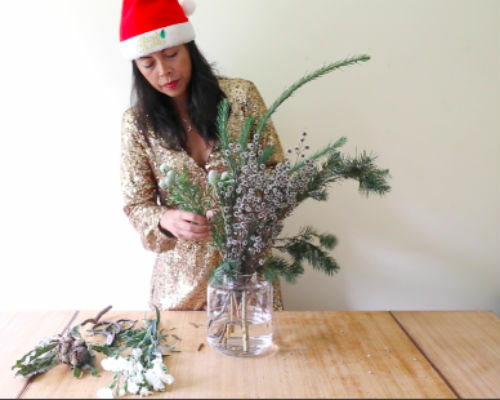 This arrangement is so easy, and a gorgeous way to bring a Christmassy feel to your home, without a hint of daggy bright red and green in sight! 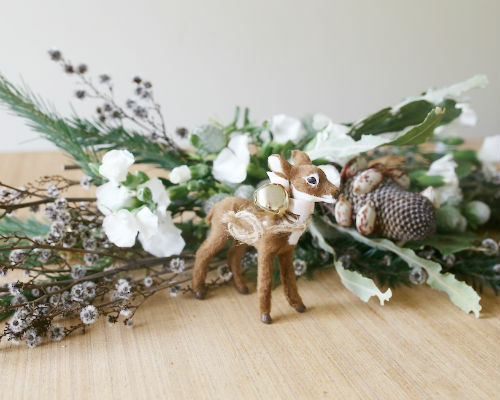 Another great festive alternative is to create a simple garland for your Christmas table. 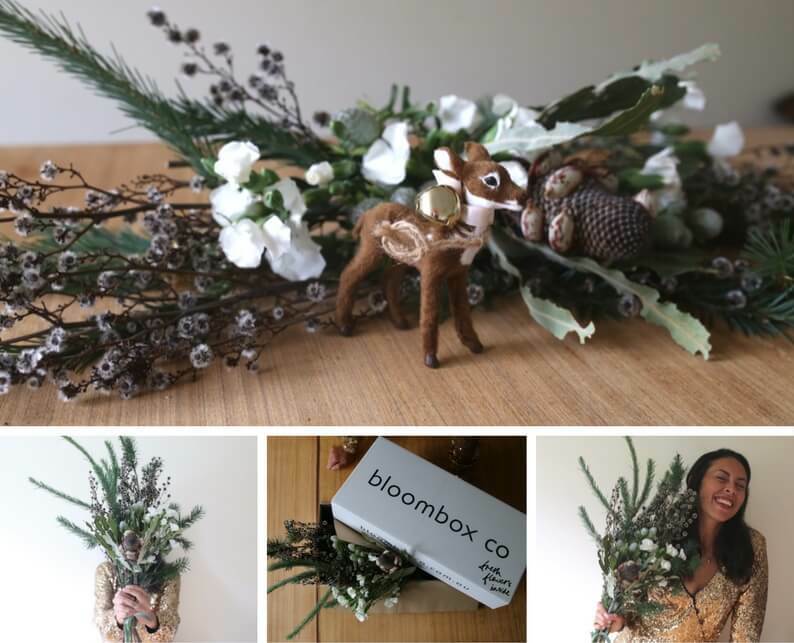 Simply lay down your foliage stems end to end to create the shape of your garland. 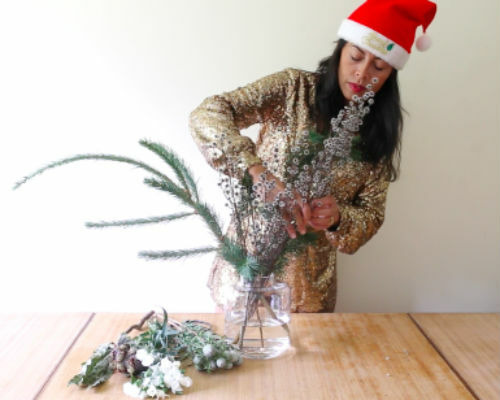 Tuck in short stems of flowers and other botanical bits into your garland, and finish with a couple of fun Christmas ornaments or candles for a celebration worthy centrepiece that’s easy AND fun! P.S. You seem like the kind of gal that knows how to really embrace every day and make every moment beautiful, so we wanted to let you know that you can get flowers just like these delivered to your door every week! 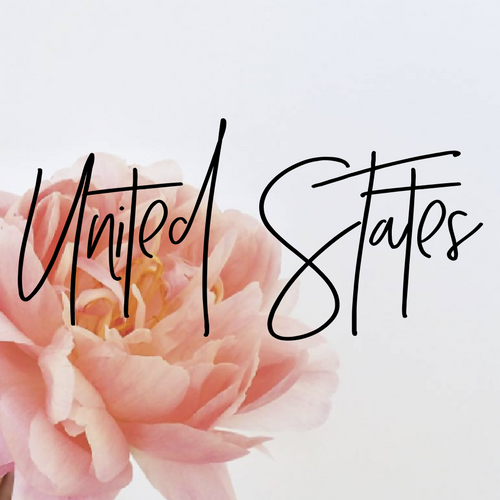 We (Phil and Mel) find the freshest, most amazing in-season flowers and send them right to you, so you can make your space and life simply beautiful. Click on your location below to find out more.